To ensure the team members were on the same page, we first needed to agree upon a shared definition for mental health, artificial intelligence, and machine learning. Next, we created a project charter to assess our understanding at a bird's eye view of the current situation, why we were pursuing the project, how we would measure success, initial goals, assumptions, constraints, and risks of the project. We further scoped to a more specific audience, as well as areas of mental health and types of technologies we would not be focusing on. In a series of in person and video chat interviews with 12 participants, we gathered insights on what caused stress and anxiety in young adults, ways they coped, expectations and attitudes towards technologies used to address mental health, and perceptions around mental health stigma. We also talked to five subject matter experts to understand the clinical research happening and current practices. We shared these insights for studio sketch sessions with prompts focusing on mental health awareness, methods for destressing, ways to reduce mental health stigma, and applications of machine learning. Next, we put the prototypes in front of users in multiple rounds of testing. Specifically, we were looking for extreme reactions of love or hate, as these provided more direction in moving ideas forward than indifference. Behind each paper prototype contained one or more hypotheses- assumptions around user behaviors distilled from our initial interviews and research. After six weeks of research, interviews, and low fidelity prototyping, we took a leap of faith to pick a direction for design and production, trusting the process that had taken us there. 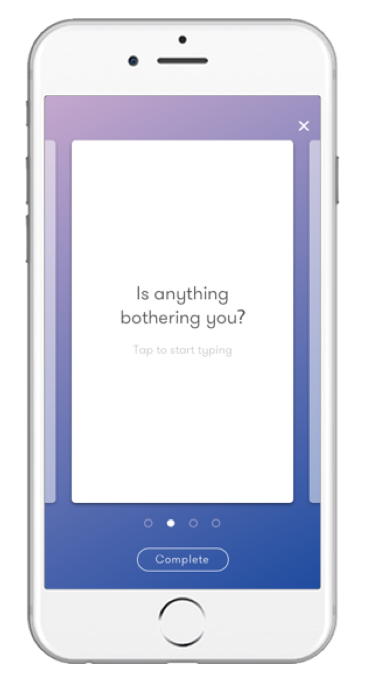 We pursued the idea of a journaling app with disappearing entries to promote detachment from thoughts while analyzing text for mood trends. The goal of the initial digital prototype was to test features we believed would add value to the experience of using the app; the core journaling feature, different ways to view analytics from the processed text, and interactions within a community feature. Over rounds of design iteration, we narrowed down the features realistic for building an MVP, the optimal user navigation through the app, and finessing of visuals that would communicate the appropriate tone. After taking the mobile first approach, we decided to translate the core features into a web app version, starting with low fidelity wireframes in Balsamiq. At this time, we decided to modify a key interaction to opening the app to a new journey entry instead of analysis, as this would encourage the action of journaling more, rather than looking at past analysis. We also believe that journaling was both an activity one may do on a large screen (web), as well as something done on the go (mobile). 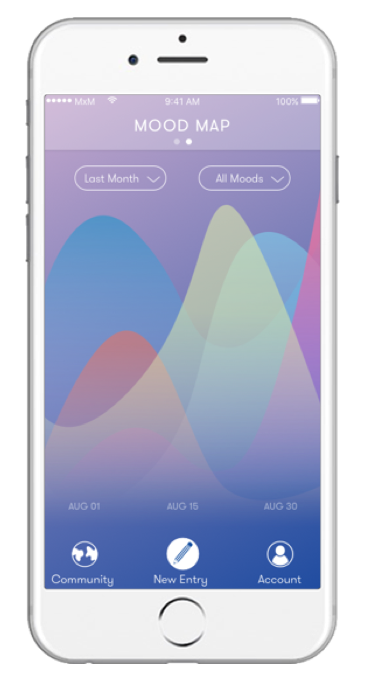 We iterated back to the concept of a color gradient mood map as an interesting visual for people to visualize their emotions. We also came back to the idea of a community feature of moods and played with the idea of sonification in which a note from a chord would appear every time a journal entry was uploaded to create a melody when multiple entries were uploaded. We heavily scoped the design to prioritize the key features necessary for MVP, including the core feature of writing an entry that disappears, as well as an analysis page that illustrates the emotions visually. This has been my favorite design project because I explored how to design for positive behavior change, thinking through how to build habits through triggers and incentives. I’m a believer that good habits are the building blocks to helping us become better versions of ourselves. In particular, iterating over the journal analysis screens required me to imagine new interactions for designing for the quantified self. Looking back and moving forward, I would revisit some key insights from our early user interviews and user testing to iterate on interactions and adding features including revisiting the community feature.